Fresh off two hefty wins, the Miami Hurricanes are starting to show a bit of confidence and poise not shown on Labor Day evening against Louisville. The offense is beginning to click behind true freshman quarterback Brad Kaaya, who threw for a true freshman-record 342 yards against Arkansas State last Saturday. With a looming road trip to a tough football environment in Lincoln, Nebraska, the whole team will have to click on Saturday night to upset the Cornhuskers (#24 AP/#22 USA Today). Here are a few of the keys to look for in the game, as well as a few key Hurricanes players that will need to have a big game to help secure the victory. Offensive Key for Miami: Ground and pound. It’s great that Kaaya torched Arkansas State for 300-plus yards and four touchdowns, but the Cornhuskers’ defense is a completely different element. Putting the game in the hands of a true freshman in a dangerous road environment didn’t work out on Labor Day, and while Kaaya has made strides in the weeks since then, Miami will need a heavy dose of its running backs, namely star tailback Duke Johnson, if it wants to win this game. It seems the coaching staff has been holding Johnson back as he only has 43 carries over three games. Expect him to have over 20 carries this Saturday. True freshman Joseph Yearby has looked spectacular backing up Johnson while averaging over five yards a carry. Big back Gus Edwards should see playing time in red zone and short yardage situations. Offensive Key Players for Miami: The entire offensive line. 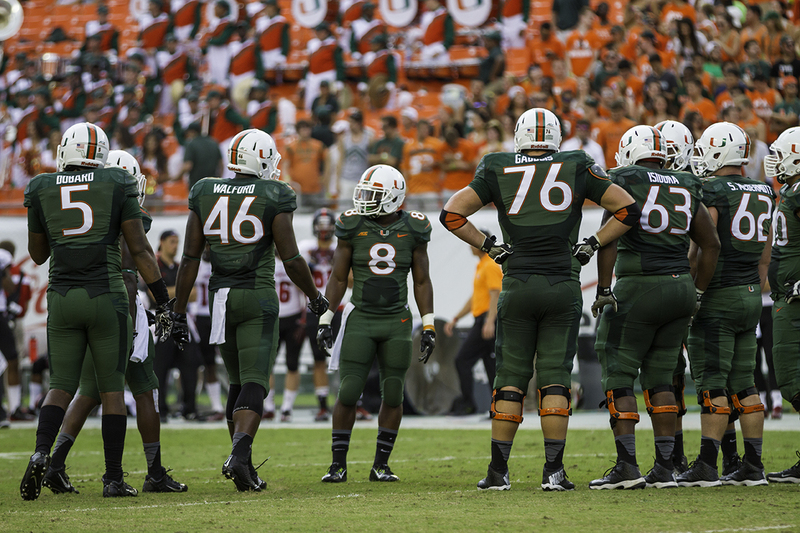 To effectively run the ball the way Miami needs to, it will need a big effort from the offensive line to open holes. It needs to create space for Johnson, Yearby, and the rest of the backs, and still keep Kaaya upright so he has time to make throws. A big part of that will be stopping Nebraska defensive end, Randy Gregory. The 6-foot-6-inch, 240-pound junior was on multiple preseason award watch lists and is an absolute terror. Keeping him out of Kaaya’s face will be pivotal for the Hurricanes offense. Defensive Key for Miami: Create turnovers. The key is also stopping preseason All-American tailback, Ameer Abdullah, but that’s a lot easier said than done. More likely than not, he is going to rack up yards like he does week in and week out. So prepare to be impressed, and make sure you watch the highlight of his game-winning touchdown reception from two weeks ago against McNeese State. Nebraska’s offense is loaded with Abdullah, a strong offensive line, dual-threat quarterback Tommy Armstrong, and wide receiver Kenny Bell, who is on the preseason Biletnikoff award list. Armstrong has completed only 53 percent of his passes this season, but has been safe with the ball, throwing only one interception. If Miami wants to win this game, the defense will need to get pressure on Armstrong and force bad throws to create turnovers. Otherwise, with playmakers all around the rest of the offense, it could be a high-scoring affair for the Huskers. Nebraska looks like the better team both on paper and on the field from the first three weeks of the season. Especially playing at home in Lincoln, the Huskers should not have to play out of its element to win this game. As long as Abdullah continues to run over defenses and Armstrong has time to make throws, Nebraska’s offense can keep up with that of any other team. For the Hurricanes to pull off this upset, they’ll need to run the ball well, keep Kaaya upright, and limit mistakes on offense. The offensive line will be critical this game. The often criticized defense will need to create pressure and turnovers. Fans shouldn’t underestimate the role starting field position could play in the game. With confidence flowing from these past two wins, it’s possible Miami travels to the Midwest and upsets Nebraska on national television. However, don’t get your hopes up too high. Prediction: Nebraska 34, Miami 20.